In Q1 of 2013, Netflix surpassed 30 millions subscribers. However, many of these same customers quickly discover that the Netflix experience is only as good as their internet connection. Netflix is one of the most popular streaming services around. Depending on how you watch Netflix on your PC, you may have performance issues. Everything from whether you use a wireless connection to your Internet speeds to your window size can make a difference in having the best picture quality possible when streaming. This guide will give you some tips on how to optimize Netflix playback on your PC. Whenever possible, connecting your PC to a wired Internet connection will always offer the best Netflix playback. Wired connections can get up to 100 Mbps depending on your ISP, modem and/or router configuration. Wireless connections, however, can be fickle depending on the weather and interference, and often have performance issues. The wired versus wireless scenario can vastly change the quality of streaming in Netflix. Netflix automatically adjusts playback based on your Internet speed. If you have two computers in your home, depending on the circumstances, one could have better playback than the other. If you notice the picture in particular beginning to degrade as you are streaming, it is possible your Internet speed has slowed below what is required for optimal playback. Testing your Internet speed through a service like Speedtest.net can give you an idea of what your download speed is so you can see if you meet the requirements of Netflix’s. PC Pitstop also offers a free Internet Speed Test. If your download speeds are low, you will want to check your hardware first, and then contact your ISP to see if there’s anything they can do on their end to increase it. This could involve a change in hardware or a better Internet plan. On a monthly basis, Netflix provides a look inside their data and compares the streaming performance for various ISPs. maketecheasier.com Netflix, video streaming. permalink. Re: #1. Wireless gives better picture than wired for me. Always get 4000 mbps bitrate (1080p)wireless vs 3000 (720p) wired. My experience with ethernet vs wifi is wifi better. Always get 4000 mbps bitrate on wifi and max 3000 on ethernet. That gives 1080p vs 720p. Does this work for streaming on any device? I stream on my bluray player and some days it is painfully slow or rebuffers every 5 minutes! Netflix and Internet Service Provider bandwidth estimates are on the high side. Good buffering makes a 2 MB connection capable of doing Blue Ray but they want you to subscribe to a more expensive line so the servers can be "released" from the data stream from time to time while the movie continues to play from the "buffer" they filled during a pause in bandwidth demand. If a $98 Blue Ray can read and stream 12.8 GB of data on a single DVD without a hitch, there is no reason that an ISP cannot stream at 14-15 Mips for two hours. Its up to the ISP to have sufficient hardware to be able to handle peak periods while still meeting "paid" bandwidth expectations, not the consumer's responsibility to over subscribe so the ISP can ignore the need to upgrade their hardware which they price into their monthly charges. Do you have any tips for streaming Netflix via an app pre-loaded in a blu-ray player? 1 can’t get rid of the icons on my TV screen after I have watched the movie and there are so many now, it is hard to find what I want. 2 I am hearing impaired and only watch those with closed captions-(wish more had them).Also the yellow captions are sometimes hard to read because they blend in with the picture, White captions on black background or some way to make the captions contrast with the background would be better. 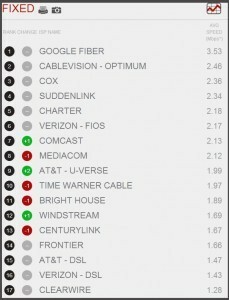 Centurylink is low on the list but our centurylink in our area now uses fiber optics. I subscribe to a speed of 12 and my speed tests have been showing 11 and Netflix comes thru great on my 60 inch Smart TV. 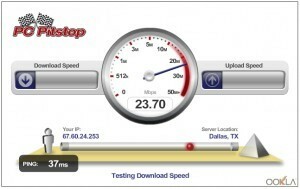 So I wonder – does the Centurylink fiber optics speed rate better? @AJ: I also use Century Link and test out at 10 mbps. We can watch Netflix on our wireless smart TV and on a 1050 computer screen (almost HD) with a direct connection to the Internet at the same time with no problem whatsoever. Gee, looking at the report of broadband speeds from ISPs, it appears that NONE OF THEM are fast enough for a High Def picture on Netflix. The fastest of them is barely 3.5 Mbps while, according to you, 4 Mbps is necessary. @Art Iverson: As far as I know they aren’t going to get Dora back, as it is now an Amazon Prime exclusive along with the rest of the Nick Jr. lineup. @Art Iverson: You might have better luck asking the folks at Netflix instead.